Everton continue the push towards the top of the Premier League table with a home fixture against the struggling, but improving Mackems on Boxing Day. Sunderland have endured a difficult campaign and Everton will look to condemn the North East team to another away defeat as Roberto Martinez’ Blues look to boost their own title credentials. Everton have an excellent record against the Black Cats, although they did lose 1-0 at the Stadium of Light last season. That defeat was the Blues first in 20 games against Sunderland and Everton will be looking to start an equally impressive run. 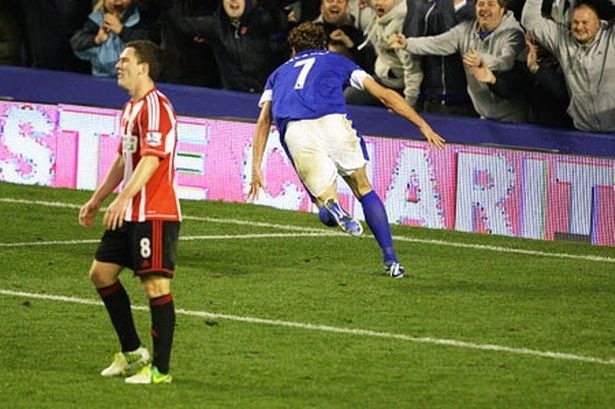 At Goodison Park, Sunderland have not won since November 1996, a period which included a 7-1 victory for the Toffees. The sides have met regularly on Boxing Day, with 5 meetings in the last 30 years. Everton are unbeaten in those games with the Blues posting a 5-0 win back in 1999, which was the last time the sides met at Goodison during the festive period. Roberto Martinez expects to welcome back Leighton Baines for this fixture, with the England left back now fully recovered from the broken toe he suffered in the Merseyside derby. Bryan Oviedo is likely to make way, which will be more than a little harsh on the Costa Rican who has performed incredibly well in Baines’ absence. Elsewhere the Blues are likely to be unchanged with Gerard Deulofeu out for another 6 to 7 weeks and long term absentees, Aruna Kone and Darron Gibson, out for the season. Sylvain Distin and Steven Pienaar did pick up knocks in Sunday’s win over Swansea, however both are expected to shake them off to take their place in the starting line-up. Possible Team: Howard; Baines, Coleman, Jagielka, Distin; Barry, McCarthy; Pienaar, Barkley, Mirallas; Lukaku. Our archive footage comes from the 1984-85 season and the 4-1 demolition of Sunderland which convinced many observers that Everton were ready to win the league. Sit back and enjoy and let’s hope the Blues serve up a Boxing Day victory as equally impressive. Previous Post Everton in the 80s – The title is on!? !